합천 회양리의 소나무는 해발 500m 정도 되는 곳에 위치한 화양리 나곡마을의 논 가운데 서 있으며 나이는 500년 정도로 추정(지정일 기준)된다. 높이 17.7m, 둘레 6.15m의 크기로 가지는 2.5∼3.3m 높이에서 갈라져 다시 아래로 처지 듯 발달하였는데 그 모습이 매우 독특하고 아름답다. 나무 껍질이 거북이 등처럼 갈라져 있고 가지가 용처럼 생겼다 하여 구룡목(龜龍木)이라고도 한다. 연안 김씨의 후손들이 전하는 바에 의하면 광해군 5년(1613)에 연흥부원군 김제남이 영창대군을 왕으로 추대하려 한다는 모함을 받고 역적으로 몰려 3족이 멸하게 되자 김제남의 6촌벌 되는 사람이 도망와서 이 나무 밑에 초가를 짓고 살았다고 한다. 마을 사람들은 이 나무를 마을을 지켜주는 나무로 여기고 오랫동안 보호해 왔으며, 민속적·역사적·생물학적 자료로서의 가치가 크므로 천연기념물로 지정하여 보호하고 있다. 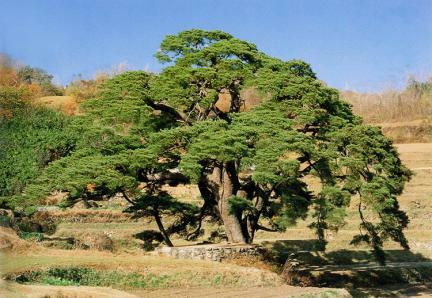 The pine tree of Hwayang-ri, Hapcheon stands in the middle of a rice paddy in Nagok Town about 500m above sea level. 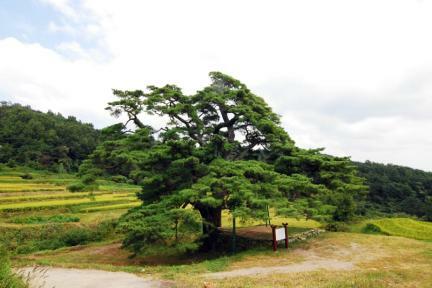 The tree is about 500 years old, with height of 17.7m and girth of 6.15m. 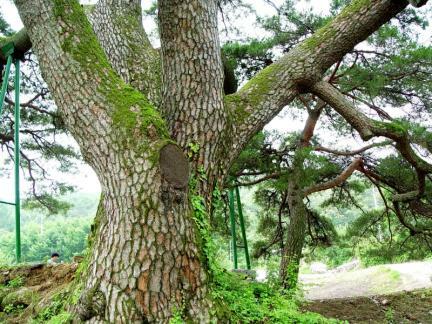 The branches were divided at a height of 2.5~3.3m, drooping downward and the appearance is very unique and beautiful. 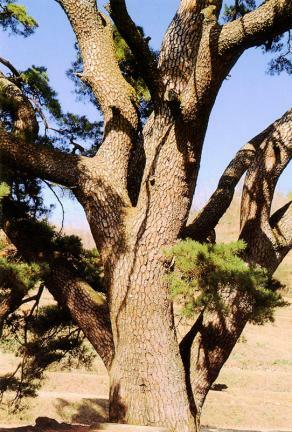 It is called Guryongmok (Gu means tortoise, ryong means dragon) because the bark is cracked like the shell of a tortoise and the branches look like a dragon. According to tradition, Kim Je-nam from the Yeonam Kim Clan was branded as a traitor for trying to overthrow the brutal King Gwanghaegun in the 5th year of his reign (1613) and place the Yeongchang Prince on the throne. His whole family and closest kin were annihilated. 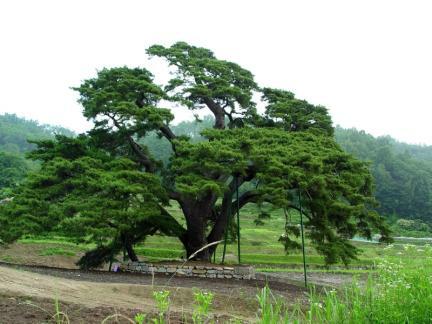 The tree is presumed to have been planted by one of his relatives escaped here and it has long been worshipped by the local community as a village guardian. 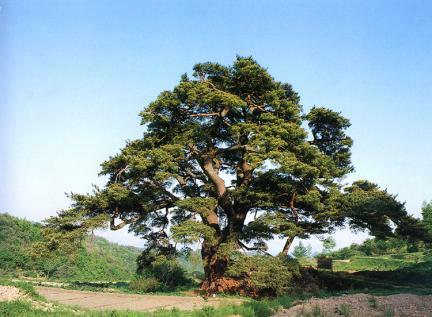 Since the pine tree of Hwayang-ri is biologically valuable and has been under the villagers' care and protection, it is designated and protected as a Natural Monument.